Ichiro was one of the greatest and most influential players of his generation. Ichiro played 14 of his 19 MLB seasons with the Seattle Mariners and will be a first ballot Hall of Famer. To celebrate the record setting career of Ichiro, Bigtimebats.com, in cooperation with Ichiro, MLB, and the MLBPA, is proud to release this exclusive Ichiro MLB career art bat. 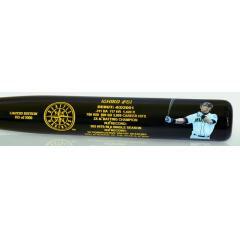 The bat features the Mariners’ logo, and the important dates and milestones from throughout his career. Ichiro's likeness appears on the barrel as exclusive reproduced artwork by renowned sports artist, Jolene Jessie. The bat measures 35 inches, weighs 32 ounces, and is officially licensed. Get your historic retirement bat before they sell out!